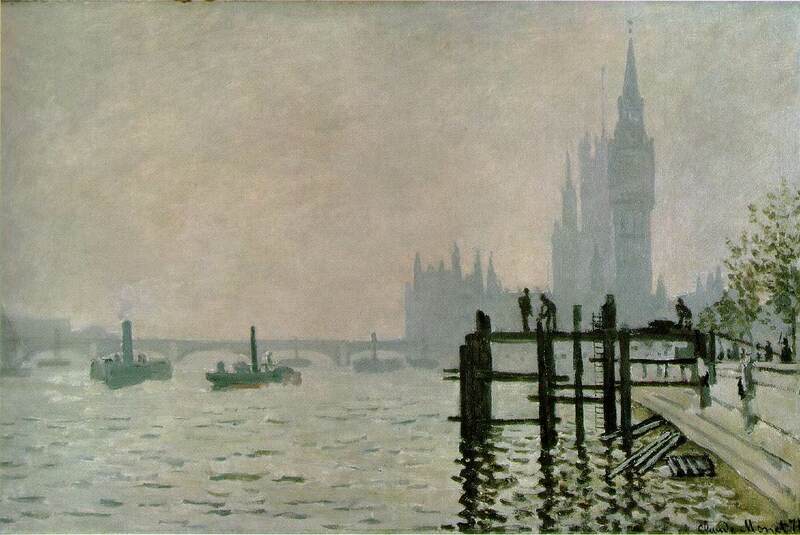 Of Monet's and Pissarro's experience of England during the Franco-German war, Pissarro was later to write, `Monet and I were very enthusiastic over the London landscapes'. However, they chose different aspects of it: Pissarro, what he described as `at that time a charming suburb' (Lower Norwood) and Monet, Hyde Park and Westminster. Monet's paintings of Hyde Park in 1871, though nothing more than stretches of grass and pathways with an indication of strolling figures are remarkably true to character though the principal product of his stay in London was the beautiful view of Westminster Bridge and the Houses of Parliament, dated 1871. The suggestion of color in the fog-laden sky is certainly Impressionist but the silhouette of the Parliament buildings does not suggest any debt to Turner, whose works the two French artists now saw. Monet observed and made use of the same flattening result of the heavy atmosphere as Whistler, whose Nocturnes belong to the same decade. The resemblance, fortuitous as it may be, is increased rather than otherwise by the evidently well-considered relation of the foreground timber pier and the buildings and bridge behind, a reminder that Monet like Whistler was an admirer of the Japanese prints in which these decorative relationships had a studied importance. 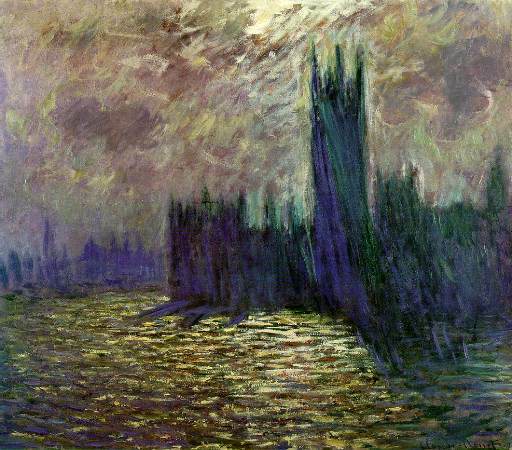 Monet was to come nearer to Turner in the later more vividly chromatic paintings of the Thames at Westminster made on his later visits in the first decade of the twentieth century. 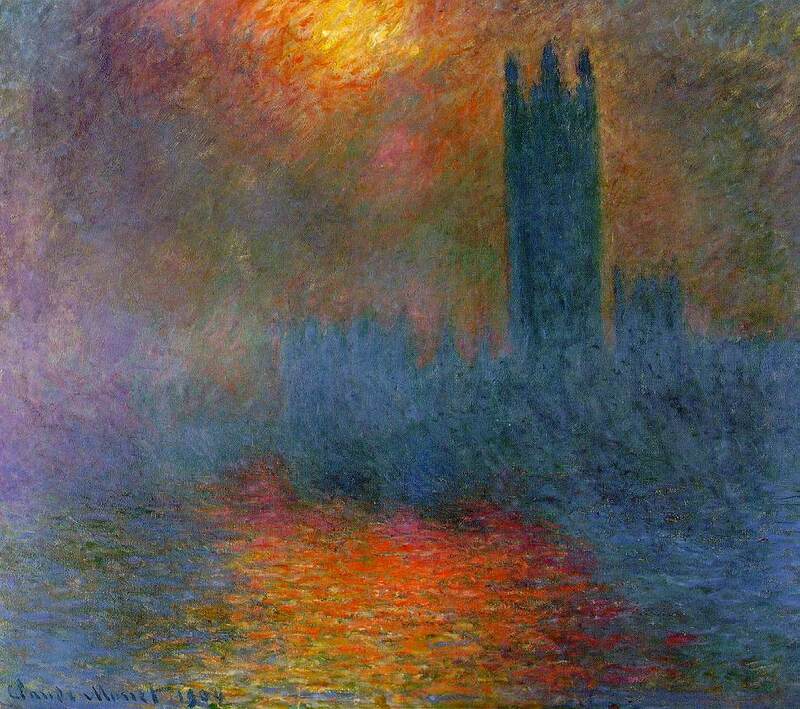 Monet used color with an increasing freedom in these later years. London as he saw it again at the beginning of the present century suggested chromatic richnesses far beyond any he had contemplated in 1871. 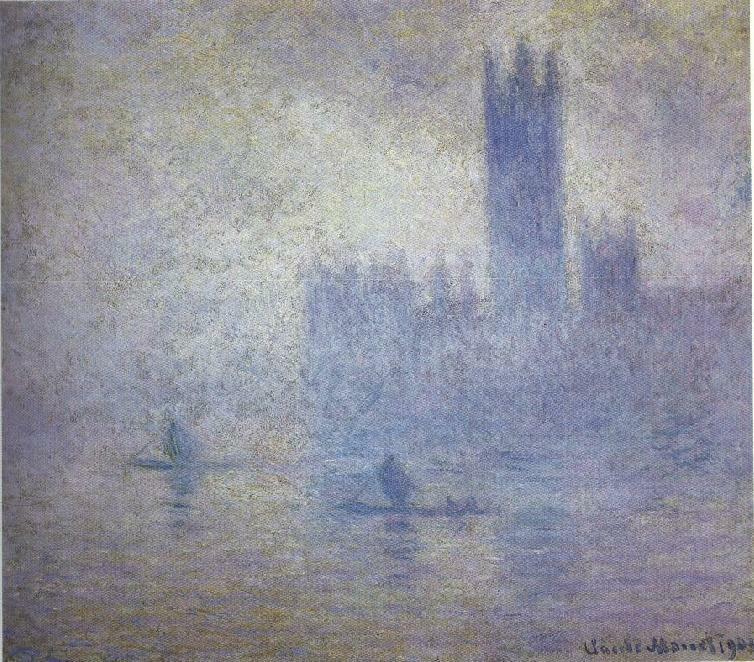 This view of the Houses of Parliament in 1904 with the sun coming through fog departed from the Whistlerian silhouette of thirty-three years before to picture densities of purple and blue with a contrast of gold that already forecast André Derain's fauve paintings of the city. All of these paintings were done on identical sizes of canvas, from the same viewpoint overlooking the Thames from Monet's window. This series is the supreme expression of his conception of an "envelope" of interactive colored light. By providing a static subject under different light conditions, the series paintings illustrate how the changing "envelope" transforms what we perceive. This final painting of the series, however, differs from the first seven. It is titled without the additional clause used in the others to describe the momentary condition of the envelope, such as "...Sun Breaking Through the Fog" or "...Effect of Sunlight". In the earlier works, the buildings and river are inert, passively affected by the envelope of light. Here they take center stage with fantastically dynamic form. The spiraling brushstrokes of the tower sweep it upward majestically, seeming to draw contrails of the envelope into its vortex. The river, too, takes on a more aggressive aspect, the highlighted wavecrests creating a groundswell at the base of the tower that contributes to the rising effect. As the tower stretches toward the bright sky at the very pinnacle of the canvas, Monet succeeds masterfully in expressing a dazzling sense of supreme aspiration.